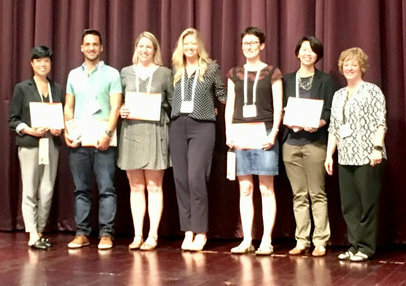 It was a great experience for a young PhD student to join the ISBNPA 17th Annual Meeting. The meeting was held in Hong Kong (03 – 06 June) and included many high quality and compelling presentations. Networking opportunities at the meeting were substantial and inspiring, allowing us to meet top researchers in a wide range of behavioural science fields. The city of Hong Kong itself provided the ideal backdrop for this event. In the field of motivational study, it was great to have the opportunity to meet Glyn Robert, Jutta Mata, Aleksandra Luszczynska, Mike Weed, and Martin Hagger in person. The debate symposium with Mike and Martin, focused on the effectiveness in the real world of interventions based on behavioural theory, was remarkable and intellectually challenging. It’s also worth mentioning the original NESI initiatives to include new investigators like myself, and the ISBNPA’s Special Interest Group symposiums. As a nominee for best poster presentation by a student, note that the quality of nominated posters and oral presentations was of a high standard. It was an amazing experience to be part of the competition and I was delighted to win the best poster award, exceeding my expectations. My poster presented the preliminary version of a scale to assess the Goal Content for Weight Maintenance, that is, the reasons behind weight management efforts. According to Self-Determination Theory, the different types of reasons people have for undertaking change may have an impact on the sustainability of that behaviour change, particularly in weight management. The scale derives from two well-validated measures in the exercise/physical activity context and presented satisfactory psychometric analysis. In the near future, we aim to publish the validation, knowing that there is room for some improvement in the model. The scale was developed in the context of the NoHoW project, a European Commission Horizon 2020 funded project focusing on weight loss maintenance using digital tools. I intend to join in the ISBNPA experience next year and hope to meet you in June 2019 for the 18th ISBNPA Annual Meeting in Prague. 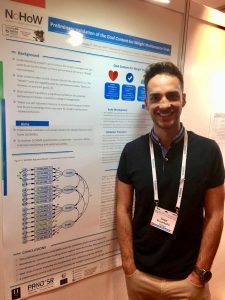 ← NoHoW well represented at ISBNPA 2018! This project has received funding from the European Union’s Horizon 2020 research and innovation programme under grant agreement No 643309. The material presented and views expressed here are the responsibility of the author(s) only. The EU Commission takes no responsibility for any use made of the information set out.